This year’s Takin’ It to the Streets festival gathered an extraordinary lineup of artists across genres and generations to provide the soundtrack for the continued Journey to Justice. 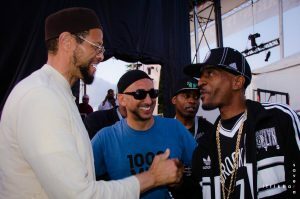 First-time meetings, like that of Imam Zaid Shakir and hip-hop legend Rakim, highlighted the unique power of ‘Streets to forge bonds across differences based on a shared vision for more just, empowering community life. 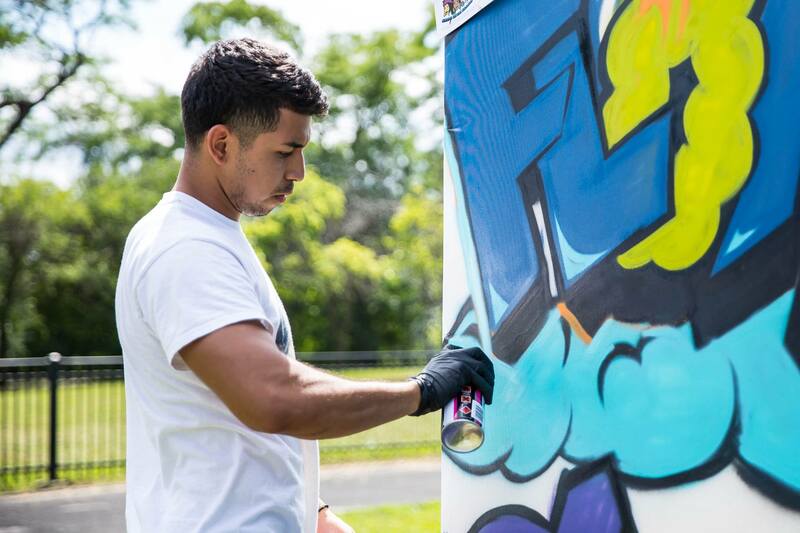 The organic connection between art and activism was on full display in Marquette Park that day, as native Chicagoan and rising star Vic Mensa performed “16 Shots”, his high-energy commentary on the Laquan McDonald shooting, in the same police district where the teen was gunned down in 2014. Ms. Ilyasah Al-Shabazz, the daughter of Malcolm X, shared the stage with international pop star Yuna, rapper Brother Ali, and other talented artists and driven activists sharing their gifts and talents. 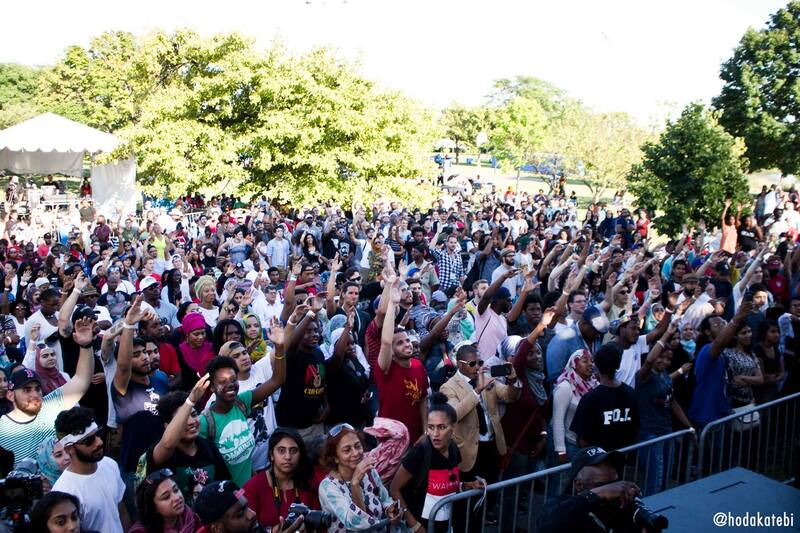 #Streets2016 was a profoundly inclusive space that represented a broad spectrum of people of all faiths, ethnicities and backgrounds. Thousands of attendees supported local businesses and artists inside the International Bazaar and at the Community Stage. Guests of all ages were inspired by the hip-hop elements and the youthful energy of the 1 LUV Family Pavilion, which included a graffiti battle highlighting the legacy of Muhammad Ali, a backpack giveaway, free haircuts and carnival rides. Without the sweat equity of nearly 300 volunteers and the incredible commitment of the Steering Committee, #Streets2016 would not have been possible. While organizing a nationally recognized and celebrated festival, they also became deeply invested in the myriad of issues that marginalized communities face. Thanks to the artists, activists, IMAN staff, leaders, volunteers and thousands of guests, Marquette Park’s legacy added a new chapter, reimagining the narrative of a community all too often associated with conflict, and demonstrating the transformative potential of Chicago, the nation and the world. 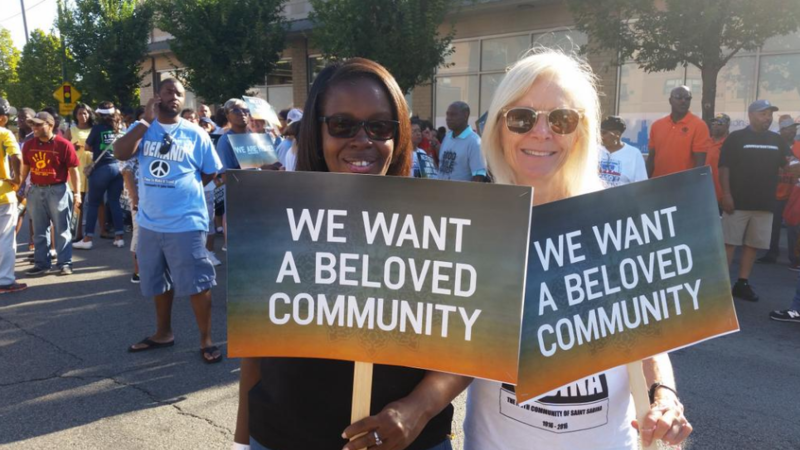 On the morning of August 6, amid chants of “We gon’ be alright,” over 1,400 people marched down Kedzie Avenue into Marquette Park, channeling the spirit of Dr. Martin Luther King, Jr. and the Chicago Freedom Movement. Fifty years prior, Dr. King and hundreds of other demonstrators walked the same route in protest of discriminatory housing practices. Since that pivotal 1966 day, Chicago organizers and activists have remained driven and inspired as they continue the journey towards a more just and equitable community. To honor this legacy, IMAN spent months mobilizing individuals and organizations across the city and across the country around the MLK Living Memorial Project. The organizing effort culminated in the ‘1000 Mile March’, an unparalleled display of unity, peace and cooperation. The march doubled the King-led effort in attendance. Youth drummers from Ayodele Drum and Dance and the Korean American Resource and Cultural Center provided a rhythm for each step of the way, while leaders such as Father Michael Pfleger, US Rep. Robin Kelly and “legacy marchers” who’d walked with Dr. King 50 years earlier, delivered words of inspiration. Calls for justice around local and international issues echoed through the streets, linking commonalities across different struggles. Chants rang out in English and Spanish, and residents carried signs demanding a “Free Palestine” and immigration reform. Marchers entered Marquette Park and concluded the action by gathering for a powerful rally. Generations of freedom fighters, from Rev. Jesse Jackson to the youth leaders of Black Lives Matter and Assata’s Daughters spoke truth to power. Organizers from across the country, like New York’s Linda Sarsour, shared the stage with piercing artistic talent like Chicago youth mentor and poet K-Love. In our time, the challenges of unfair housing policies, unjust violence and poverty persist. 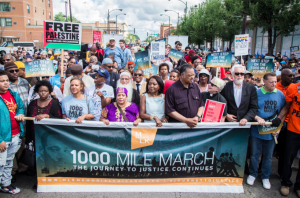 The 1000 Mile March gave activists and residents alike the opportunity to pause, reflect, and honor their collective struggle. A truly historic moment for the Marquette Park community, the march shined a light on what united communities can accomplish in the face of bigotry and discrimination. 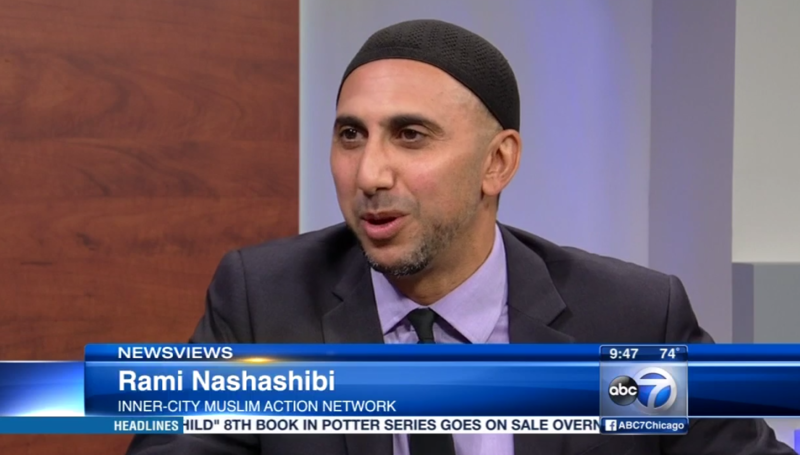 IMAN was able to demonstrate power by mobilizing local families, neighborhood institutions, and major foundations from across the city to take this critical first step toward much-needed healing and toward the world as we know it could be. On Friday, August 5, hundreds of people gathered at Marquette Road & Kedzie Avenue for the unveiling of the Dr. Martin Luther King, Jr. Living Memorial. That day, which was the 50th anniversary of the 1966 march that Dr. King and the Chicago Freedom Movement led through Chicago’s Marquette Park, not only recalled the legacy of past struggle for justice and equity but recognized the achievements and sacrifices of other local and national organizers. 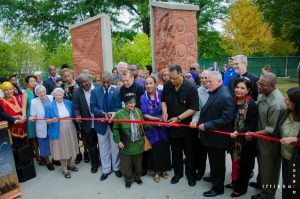 Following a brief ribbon cutting, guests enjoyed a special commemorative ceremony in Marquette Park, in the very space where angry residents once violently clashed with Dr. King and the other marchers only 50 years earlier. Artists including Zeshan & The Transistors, K-Love, and Tammy McCann provided a powerful soundtrack for the momentous occasion, while Rev. Jesse Jackson, Saint Sabina’s Fr. Michael Pfleger, and Imam Omar Karim offered spiritual reflections. The memorial itself depicts the events of August 5, 1966, the images of renowned faith and community leaders who have worked for justice in and around Chicago ever since–such as Imam Warith Deen Muhammad, Rabbi Robert Marx, and Reverend Willie Barrow–and reflections on what the “Beloved Community” could look like. 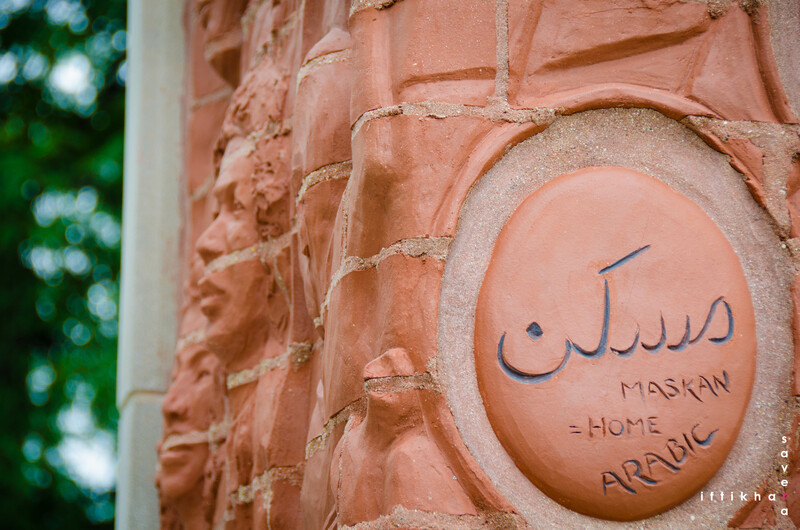 The sculpture also challenges the notion of “home” for families denied the basic human right to live freely in thriving communities and includes thoughtful reflections from hundreds of community members on what home means to them, in the form of colorful ceramic tiles that adorn the bench around the memorial. 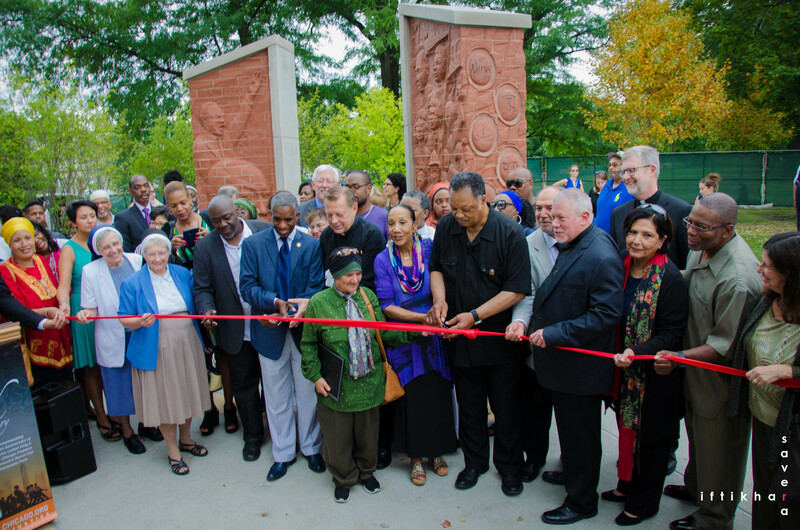 The MLK Living Memorial was made possible by a dedicated city-wide Planning Committee and a Local Task Force, convened monthly by IMAN. An extensive list of major supporters and foundations contributed to the construction of the project, and we thank them for their help in establishing a new cultural cornerstone for the Marquette Park area. Several legacy projects, including the 1000 Mile Scholars Youth Fellowship Program and the Beloved Community Ceramics Studio, are being developed in order to further the legacy celebrated by the memorial. Visit www.mlkmemorialchicago.org today to learn more about the projects. The success of the Martin Luther King, Jr. Living Memorial and #Streets2016 garnered extraordinary media coverage across the city and country. Throughout the MLK Living Memorial development process—from the initial planning, to the ground breaking, and eventually to the ribbon cutting—TV cameras and newspaper reporters captured the project’s growth into a new cornerstone of the Marquette Park community. On August 5 alone, nearly one million Chicagoland viewers tuned into coverage of the Memorial’s unveiling and the following commemorative ceremony. The next day, #Streets2016 kicked off with the symbolic 1,000 Mile March. Each of Chicago’s local TV news networks featured segments on the day’s events, with detailed feature stories on the web and in print. Via this comprehensive media coverage, over a half million people witnessed the events of this historic day. Social media yielded even greater engagement. The memorial, march and festival were all featured on Snapchat’s “Chicago” story that weekend, and the #Streets2016 hashtag trended on Twitter for several hours. In all, these IMAN-led efforts made over 6 million impressions across all social media platforms. Marquette Park’s narrative legacy has endured the stains of decades-long segregation and racial discrimination. However, through these powerful efforts of a community united on the journey to justice, the story of Marquette Park is forever changed. The “world as it could be” was on full display during the August 5 weekend, as individuals, families and organizations celebrated their achievements, connected various campaigns and radically reimagined the state of their communities. 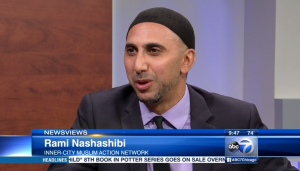 Perhaps even more powerful than the breadth of coverage the weekend received is the fact that this nationwide buzz grew organically out of a proactive series of community organizing efforts led by American Muslims and embraced by all. Like all aspects of its work, IMAN hopes that the MLK Living Memorial, the 1000 Mile March, and #Streets2016 festival will serve as models for holistic, collaborative, and positive change for other urban communities across the country.